The elegant traditional 800mm vanity unit and high level toilet suite from our exclusive Downton Abbey range, ideal for creating a period look in your bathroom. Toilet has been manufactured using high-grade vitreous china ensuring a quality finish and long lasting durability. Bring a touch of elegance and style into your bathroom. 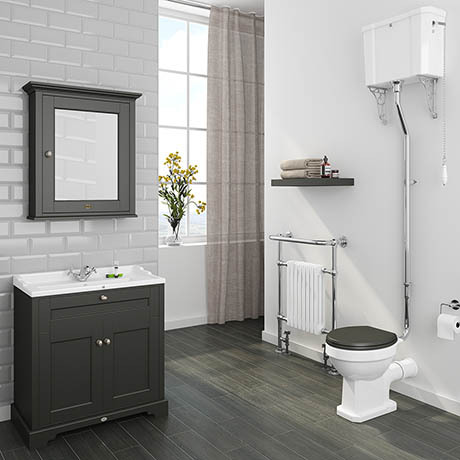 Comes with a soft closing wooden toilet seat and a high level chrome flush pipe kit with traditional ceramic pull lever. The luxury 2 door vanity unit has been beautifully finished in Charcoal Grey. The unit is crafted to the highest standards and features elegant brushed satin nickel handles with panelling detail, whilst the gloss white ceramic basin comes with the option of 1 or 3 tap holes.